I read this article and found it very interesting, thought it might be something for you. The article is called How Demonetisation Will Boost Cashless Economy and is located at https://archive.indiaspend.com/making-sense-of-breaking-news/how-demonetisation-will-boost-cashless-economy-85591. Datum 1: Bank branches increased at 5% per year, but automated teller machines (ATMs), debit cards and card-swiping machines have doubled in four years and online transactions have grown 20 times in six years to 2016, Reserve Bank of India (RBI) data show, a process likely to be greatly boosted by demonetisation. Datum 2: Currency in denominations of Rs 500 and Rs 1,000 increased 50% over three years (from Rs 9.6 lakh crore in 2012-13 to Rs 14.1 lakh crore in 2015-16), according to RBI data, while India’s gross domestic product (GDP) increased 22%, and per capita income rose 18% over this period. With the base created by bank accounts linked to Aadhaar, the national identification system, and the upcoming Unified Payments Interface, which will offer payments through mobile phones linked to bank accounts through a unique number, demonetisation will help speed the transition of a predominantly cash economy to a cashless one, Nandan Nilekani, former chairman, Unique Identification Authority of India, told Mint. At the same time, the shadow economy–meaning people do not account for it and do not pay taxes on it–is about a quarter of India’s GDP, according to this 2016 note from the finance ministry. Only 1% of India’s population pay income tax, according to Income Tax department data. Prime Minister Narendra Modi on November 8, 2016, announced a war on black money, declaring that two currency denominations Rs 500 and Rs 1,000–which constituted 85% of cash with Indians–were no longer legal tender. His intention was to have money earned legitimately but held in cash deposited in banks and unaccounted money rendered useless. 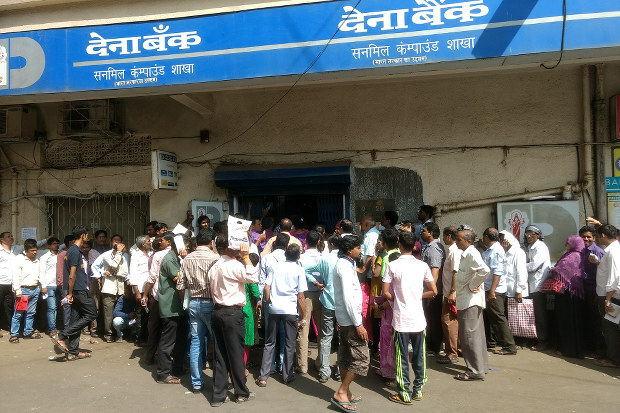 As banks reopened after a mandatory one-day closure on November 10, and ATMs reopened on November 11, Indians thronged them, mostly to deposit available money rather than withdraw it or exchange old notes, evident when IndiaSpend visited various banks in Mumbai and Delhi. It was in 2004-05 that the value of Rs 500 and Rs 1,000 notes put together exceeded the value of all other denominations, namely Rs 100, Rs 50, Rs 20 and Rs 10. In 2000-01, denominations other than Rs 500 and Rs 1,000 constituted 70% of the cash in the economy; they constitute 15% today. The value of money made up by Rs 500 and Rs 1,000 notes went up from a quarter of cash in circulation in 2001 to 85% in 2016. The currency with people rose rapidly during the last three years–2013 to 2016–against deposits kept by people in banks, RBI data show. From being almost equal in 2007, currency with Indians was 50% more than bank deposits in these three years. The Bharatiya Janata Party (BJP)-led National Democratic Alliance (NDA) government, in its first budget in 2014-15, announced the Pradhan Mantri Jan Dhan Yojana (Prime Minister Financial Inclusion Scheme) to boost financial inclusion in the country. As many as 250 million bank accounts have been opened in two years to 2016. There are 132,834 bank branches in India, of which 38% (50,554) are rural, according to RBI data. Rural branches rose 28% from 39,368 in 2013 to 50,554 in 2016. However, in the last two years, the rate of addition of rural bank branches has slowed down while the rate of addition of urban branches has remained fairly constant. There is one bank branch per 10,000 Indians while there is one ATM per 5,000 Indians. State Bank of India, the biggest bank in India, has close to 50,000 ATMs. The State Bank group—six banks under the State Bank banner—has more ATMs than all private bank ATMs put together across India. Maharashtra, India’s most industrialised state, has the highest number of ATMs. 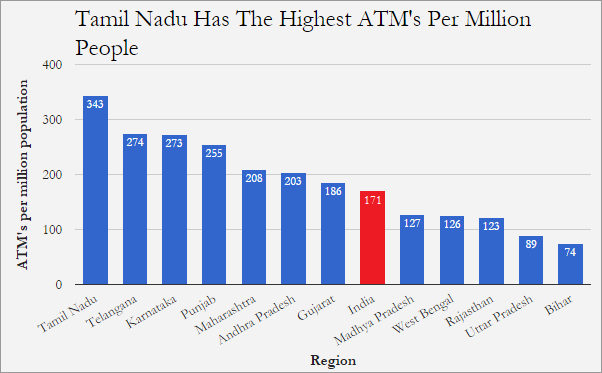 But, the density of ATMs—machines per million population—which determines the ease with which people can access their money, is the highest in Tamil Nadu with more than 343 ATMs per million people. Maharashtra comes a distant fifth in ATM density amongst the big states in India with 208 ATMs per million. Bihar is worst among the big states with 74. ATMs in rural areas have increased 200%—or tripled—in three years from June 2013 to June 2016 when the total number of ATMs rose by 75%. The number of debit cards in India more than doubled between 2012 and 2016. Over the same period, point-of-sale or PoS machines—the credit/debit card-swiping machines in hotels and shopping malls—also more than doubled. All these have contributed not just to financial inclusion but also to making a gradual shift towards cashless economy, which reduces dependence on cash. Online transactions through the National Electronic Fund Transfer—popularly known as NEFT—rose from Rs 4 lakh crore in 2009-10 to Rs 83 lakh crore in 2015-16, a 2000% rise. Businesses that work on cash and credit are are in a dilemma after the currency shock. E-commerce firms have discontinued cash-on-delivery option, and daily sales have reduced, e-commerce experts told IndiaSpend. I am using internet banking and mobile transactions with a qualification of SSLC in Malayalam medium. I was not bothered due to the closing of ATMs for two days and one day of the banks. I purchased everything through mobile banking – from medicine to provisions. Unfortunately, shop keepers were not aware of mobile banking. My mobile transactions varied from Rs 30 to Rs 1,000 in many places after November 8, 2016. Excellent analysis but when talking about demonetisation, no need to give present availability of bank ATMs in the country.